Eine tolle Wohnung in super Lage und sehr nette Vermieter. This was our “home away from home” during our stay in Munich. It was convenient to transit choices (train about a 10 minute walk and a bus stop just down the street). Several groceries and bakeries are near by. Also a number of neighborhood restaurants. The apartment was very clean and has a well equipped kitchen with a view of the Munich skyline to the west. Andreas and his family were very welcoming and even did some laundry for us so we could have some clean clothes for the last few days of our trip. We will certainly consider staying here again the next time we are in Munich. thank you very much for your kind recommendation. We are happy that you found it comfortable in our flat and would like to stay again. Great location because your away from the hubbub of the city but have excellent public transportation right outside the door to take you wherever you want to go quickly. Plus, there are a number of good restaurants and anything else you might need close by-supermarket, bakeries, dry cleaners, bank, etc etc.The owners are lovely people and very accommodating. We have stayed in many properties in recent years and this kitchen was excellently equipped. There was even a spaetzler maker! Apartment is very large and would be very comfortable for a family. Highly recommended! We plan to return as soon as possible. This is a lovely property. The apartment was very clean, bright and spacious with all the amenities we required. Transportation was available within walking distance, as well as a grocery store and bakery. The hosts were very helpful. 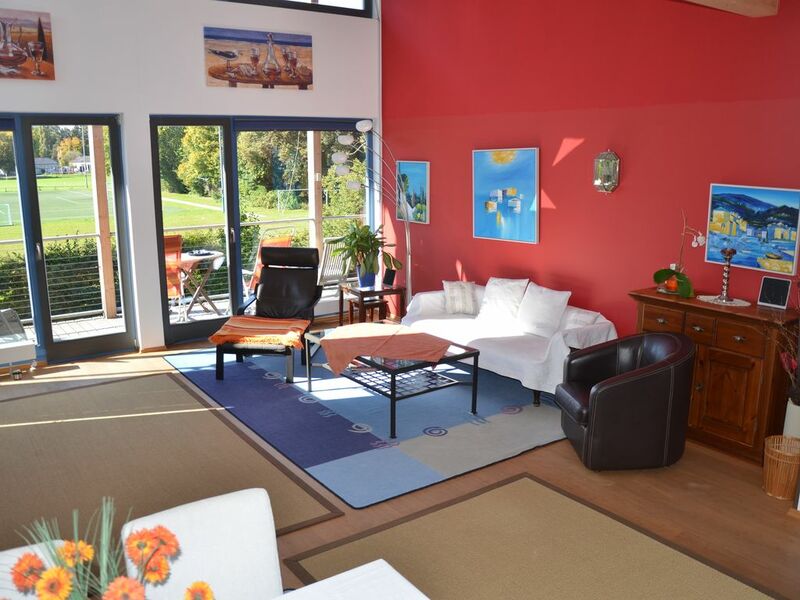 The Familie Klein provide a very spacious, clean, and complete experience at their home in Bogenhausen. The neighborhood is comfortable and attractive, there are plenty of nearby services, and a short 10-15 minute walk to the S-Bahn makes it easy to get anywhere around Munich. It's a great respite from the busy city center. Much more than location, however, is the beautiful and beautifully appointed apartment. The pictures do not do it justice. Large and light, with everything one may need. It is furnished like a home, not a generic rental. Can't recommend it enough. We had a lovely time in this property. It was very nicely appointed with lovely long balcony along the South-West side overlooking park and football ground, and it had pretty much everything you needed. There is no washing machine in the apartment but the owners who live downstairs allowed us to use theirs. They are generally very friendly and helpful and were always at hand if we needed anything. The apartment is located in a lovely leafy residential area with bakery, supermarket, ice cream parlour, beer garden and restaurants are all within a 5 minute walk. The bus is also a short walk away and takes you to the U-Bahn station of Arabella Park. The S-Bahn is also about a 10 minute walk away. Both of these options take you into the centre of Munich. During our stay, the temperatures in Munich were exceptionally high (35 degrees C) which made the apartment stuffy during the day, but we were able to cool it down in the evenings by opening the large doors and windows on both sides to get a breeze through. The only reason we didn't give the apartment 5 stars was because there are some smaller high up windows at the in the bedrooms which don't have curtains or blinds to block out the light, so we found ourselves waking up very early in the mornings and it was difficult to get the kids to sleep early in the evenings for the same reason. *Der Preis pro Übernachtung bezieht sich auf 2 Personen (ab 4 Übernachtungen), jede weitere Person kostet 25 Euro pro Nacht. Kinder bis zum 1. Lebensjahr zahlen nichts zusätzlich, zwischen 1 bis 16 Jahre 15 Euro, darüber 25 Euro pro Nacht. Der Preis ist am Ankunftstag in bar fällig. Die Kaution beträgt 150 Euro und ist ebenfalls am Ankunftstag fällig. Wir bitten um eine Anzahlung von 200 Euro. Die Kosten für Endreinigung betragen pauschal 40 Euro. Zu Messeterminen können die Preise abweichen.